Once in a while, it’s a good idea to step back and look at the chart in a greater scale. Now that we made a killing in selling EURUSD, it’s good time to stop trading, and check where we are. The first chart we are looking is performance of 8 cross-usd currency from November 26, 2009. In other words how much each currency appreciated (depreciated) against US dollar. Click on the chart for an enlarged image. The reason why I took November 26, 2009 as the origin in this chart is that it is the bottom of US dollar index so far. 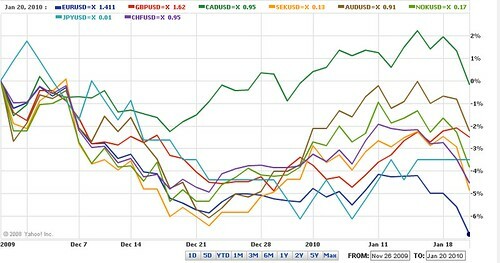 As of January 20th, performance from the top is CADUSD, AUDUSD, GBPUSD, JPYUSD, NOKUSD, CHFUSD, SEKUSD, EURUSD, but they are all depreciating against US dollar in past 2 months. And as you could have well expected, Euro is sold badly, nearing 7% decline in 2 months. My trading plan is focused around the US dollar strength this year, and especially I will focus on Euro weakness against US dollar. Among the 8 cross-USD currencies in the first chart, all of them except AUD and NOK are used to calculate US Dollar Index. 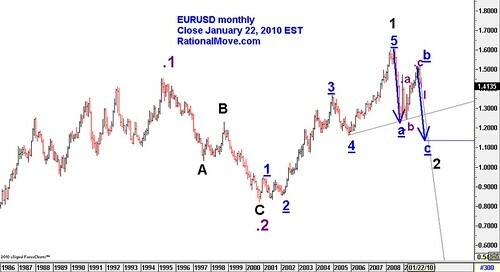 It is a weighted geometric mean of the six currencies, and in fact EURUSD is weighted 57.6 percent. It is good to have these images in mind when we construct trading plans even for the short term trading. From the next chart, I will focus on EURUSD. First I show you the very long term: monthly chart. In this time span, it is very difficult to count Elliott waves because we have very few waves in the past that we can use as the reference. So, I am not sure at all whether my purple .1 and .2 or even black labels are correct. But I can be more confident about the blue underlined labels. So, if you look around the black 1, you will see blue underlined 1 to 5 is complete. It is likely, from this count, we are in some kind of corrective wave. And because the blue underlined a was so severe downtrend (2008 financial crisis), I would expect the current wave to be blue underlined c in a a-b-c- zigzag wave. In zigzag wave, the initial descent (blue underlined a) can be used as a reference to estimate how far c wave would go (blue arrow in the chart). The end of the arrow is pointing around 1.1380. 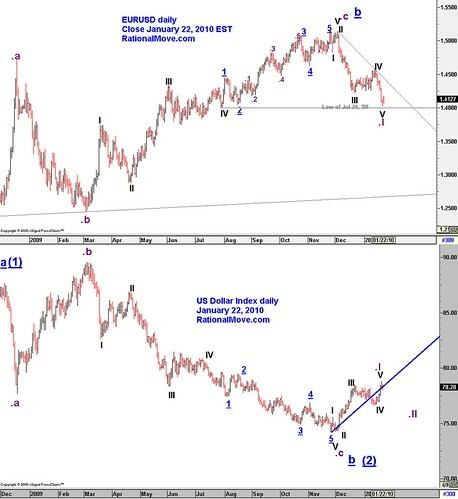 EURUSD went down badly since November 26 of last year, but it looks like we have just started out journey. While I won’t be surprised to see another push down towards 1.4000, I think the initial 5 waves descent of the EURUSD has ended. 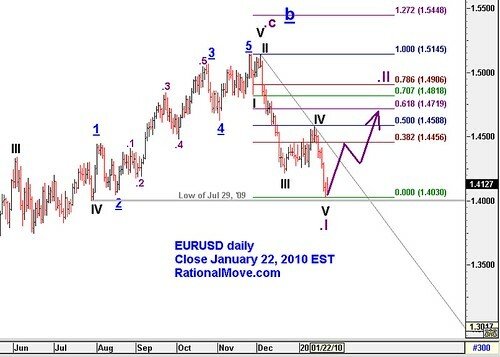 I often see 61.8% or even 78.6% retracement after any Wave 1, so EURUSD may rebound towards 1.4720 in February. So my plan is not to trade until EURUSD will break the gray trend line resistance, and count the wave in shorter time span, and probably we have time to long EURUSD once or twice to make some money before the purple II finishes.